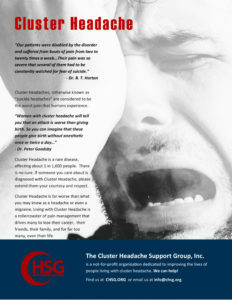 Verapamil is currently the best available prophylactic drug for patients experiencing cluster headaches (CHs). Published papers usually state 240 to 480 mg taken in three divided doses give good results, ranging from 50% to 80%; others mention higher doses—720, even 1200 mg per day. In clinical practice we found we needed to adapt dosage to individual’s time of attacks, in particular giving higher doses before going to bed to suppress severe nocturnal episodes. A few only required 120 mg daily. We therefore evolved a scheme for steady and progressive drug increase until satisfactory control had been achieved.